The 12 gauge has been around since the 1870's, supplying America and the world with one of the best close range firearms. With the massive amount of lead and energy that the 12 gauge puts out, it is ideal for military and law enforcement use, as well as hunting, self defense, and sport shooting applications. Winchester has been around since 1866, making them one of the oldest ammunition manufacturers in the world. For over a century, Winchester has been a leader in the firearms and ammo industry. 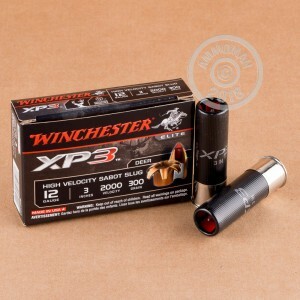 With these high velocity 3" shells from Winchester, you have the velocity and power required to bag that next trophy. 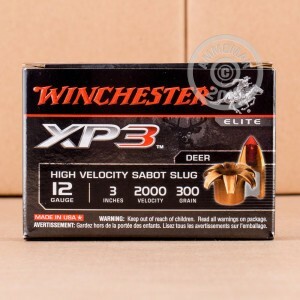 These XP3 rounds feature a 300 grain sabot slug that leaves the barrel at a blazing 2,000 feet per second! These projectiles are lead-free and can be used in lead restricted hunting areas. 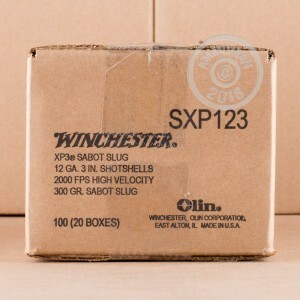 When you experience the power and quality of Winchester, you will know why they have been so successful. Don't forget, at AmmoMan.com all orders over $99 will ship for FREE!